Simply looking over the numbers, it might be hard to wrap your head around what Apple just announced for their Q1 2012 results. A company this big is not supposed to be able to nearly double revenue year-to-year. Nor are they supposed to more than double profit. But Apple did both. The numbers are so big that they almost seem like they should be typos — especially coming after a quarter that was a “miss” (though we can now clearly see what a joke that “miss” was). So perhaps it’s best to point out some bigger numbers and to frame some of them in ways to make them easier to understand. That’s what all of Twitter seemed to be doing anyway during the earnings call this afternoon. 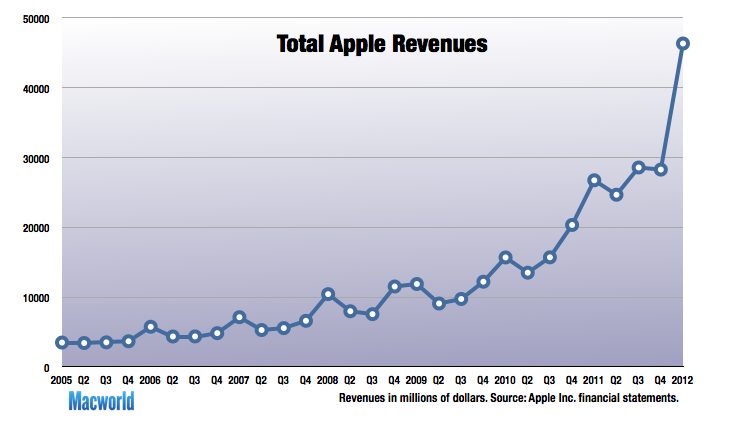 Apple’s profit of $13.1 billion was equal to their revenue in Q4 2010, as Jordan Golson notes. To be clear, that was just a year and a quarter ago. That’s how quickly Apple is growing. Apple added $38 billion in cash to its reserves just in the past year alone, as Horace Dediu points out. They now have $97.6 billion in cash and equivalents. $64 billion of that is offshore, Apple CFO Peter Oppenheimer stated during the call — meaning, it would cost money (taxes) to bring it back into the U.S.
Apple’s cash hoard alone is worth more than all but 52 companies on Earth, as Dennis Berman notes. Apple earned more money last quarter than the entire company was worth (in terms of market cap) just eight years ago, as Mathew Ingram relays from Eddy Elfenbein. Apple likely sold three times as many iPads as Amazon sold Kindle Fires. At twice the price. And at a profit, as Jon Fortt notes. When asked about the impact of the lower-cost tablets, Apple CEO Tim Cook specifically mentioned the Kindle Fire and noted that when looking over Apple’s numbers, they didn’t seem to see any impact (positive or negative) from the Kindle Fire being on the market. Apple’s revenues, while massive, are nothing compared to a company like Walmart, which reported $109.5 billion in revenue last quarter. BUT that $109.5 billion only turned into $3.3 billion of actual income for the quarter. In other words, Walmart has more than double the revenues of Apple, but Apple has more than four times the profits of Walmart. That’s remarkable. Apple’s profits place them on this exclusive list of the most profitable quarters among corporations. You’ll note that Apple is the only company on the list that’s not an oil and gas company. And they’re a “mere” $3.2 billion from the top spot. Back in July, we noted that while Apple was destroying their tech peers in profits, HP still held the revenue crown. Not anymore. HP’s last reported quarter (in November) saw the company announce $32.1 billion in revenue. They’ll report Q1 2012 earnings in about a month, but if history is any guide, Apple will be far, far ahead of both numbers. Likely well over $10 billion ahead. It was only October of 2010 when Apple passed Microsoft in terms of revenue. At the time, Apple posted $20.34 billion — they’re well beyond double that now. Microsoft’s most recent quarter saw record revenue of $20.9 billion. Again, Apple came in at $46.33 billion. Meanwhile, it was only April of last year that Apple surpassed Microsoft’s in profit. This past quarter, Microsoft’s net income was $6.62 billion. Apple’s was $13.06 billion. The iTunes Store alone generated 50 percent more revenue than all of Yahoo did last quarter, as Jordan Golson notes. Apple’s profits for the last quarter exceed Google’s entire revenue for the last quarter, as Farhad Manjoo points out. And it’s not even close ($13 billion to $10.6 billion). Think about that for a second. And actually, Apple’s profit for the entire year now beats Google’s revenue for the entire year, as Marcel Molina points out. That gap is likely to get bigger given the most recent quarter. After a short halt in after-hours trading following the earnings release, Apple’s stock popped nearly 10 percent from where it closed at the end of the day. Since then, it has settled back into the $450-a-share range which would be far and away a new record high for the stock if and when it opens around there tomorrow. That surge also pushes Apple well beyond the $400 billion market cap — and once again past Exxon as the most valuable public company in the world. At over $400 billion, Apple is now worth more than Greece, CNN Tech says. Apple’s gross margin for the quarter was 44.7 percent — a number which Oppenheimer stated he’s never seen in his 15 years at Apple. Of note, he also doesn’t expect Apple to ever post a margin that high again. Apple sold half as many Apple TVs last quarter (1.4 million) as they did for the entire previous fiscal year. But Cook still considers the product a “hobby” — though it’s one he “couldn’t live without”. Apple’s profit last quarter was $3 billion more than all of Hollywood’s gross box office receipts for all of last year, notes Eric Spiegelman via Anthony De Rosa. With 37 million iPhones sold last quarter, Apple is now the largest smartphone marker, besting Samsung’s (guesstimated) 35 million, as The Next Web remembers. Apple is now selling twice as many iPads to K-12 schools as Macs. Perhaps that will help with this issue. But perhaps all you really need is a picture. Just look at the chart Macworld made below. It’s absolutely staggering.